Snowy! Thanks to our friends at IMPAwards, a high res version of the latest poster for Steven Spielberg & Peter Jackson's The Adventures of Tintin has hit the web. I just love how they're kind of going all out and doing anything they want marketing this. They've got the giant Unicorn ship rolling in front and center, plus even the heads of Thomson & Thomson and Captain Haddock. Just seems like a perfectly fitting poster for an adventure movie like this. We still haven't seen anything online recently besides that international trailer, but this poster can hold us over until the next trailer shows up. I'm already looking forward to this. 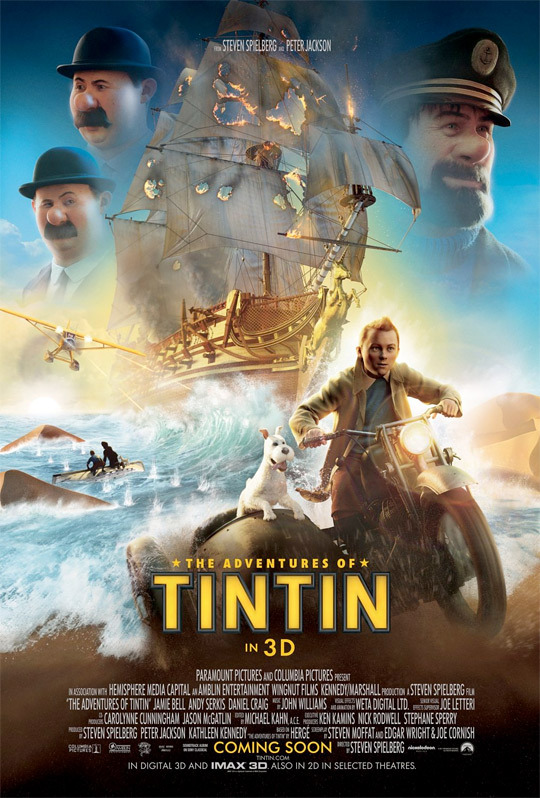 The Adventures of Tintin: The Secret of the Unicorn was originally directed by Steven Spielberg, produced by Peter Jackson with a script co-written by Steven Moffat, Edgar Wright and Joe Cornish. The cast includes Jamie Bell as Tintin, Andy Serkis as Captain Haddock, Simon Pegg & Nick Frost as Thompson & Thompson, Daniel Craig as the villain Red Rackham, and Toby Jones as Silk. The animated movie, in the works at Weta Digital, will hit US theaters in glorious 3D starting on December 23rd, Christmas weekend, late this year. We featured the first look in December and the first teaser trailer in May. We'll keep you updated on Tintin! Nice poster. In europe, going to see this film is a no-brainer. But how are they marketing it in the US? Tintin is rather unknown in the US, or? I think they're mainly pointing out that it's Spielberg & Peter Jackson, also the great animation and the epic adventure. I´m sorry people, this will be soulless drivel. They´re obviously doing the best they can with yesteryear´s mocap animation tech and your typical Hollywood bombast but it´s really not good enough AT ALL for a Tintin adaptation. He deserves better and now I´m sad. So after 2 trailers and a poster for a yet to be completed movie and you call it this way now? Give it a rest and how about waiting till you see the movie BEFORE passing judgement. Why are you saying "they're going all out and doing anything they marketing this"? They released a trailer and some posters, how is that going all out? I'm sorry, i don't want to troll, but... For me the worst thing about this movie is realizing americans call "Milo" Snowy, that's awful. I don't know, I don't see this being an amazing movie people will never forget, but it will do well. And I actually liked Polar Express, I think that movie was a great Xmas movie. Except we haven't seen Daniel Craig's character, Red Rackham. And Toby Jones's Silk has only appeared in the trailer. So no, Alex, we're not getting a full look at *everything*, just a good chunk of it. Suffice to say they're confident that they've avoided the Uncanny Valley, and aren't obscuring their characters' faces out of fear of a Mars Needs Moms-type backlash, like a lesser company might have done. did they drop the 'Secret of the Unicorn' subtitle? With a script co-written by Doctor Who's Steven Moffat, this could be big. I love Spielberg, but... why does it feel like the announcement of yet another Jurassic Park is to make sure his bankability (as a film maker, not as a person) stays high? Is there anyway to get/buy the poster? Still looks lame. Spielberg's and Jackson's names are tiny on the poster. And Tintin has no brand value outside Europe.